The front end comprises of the usual pages like Home, About Us, Why us, Services, etc page which can be managed through the CMS / Admin panel. The main functionality is the “Request for Quote” functionality which integrates to the backend CRM system. 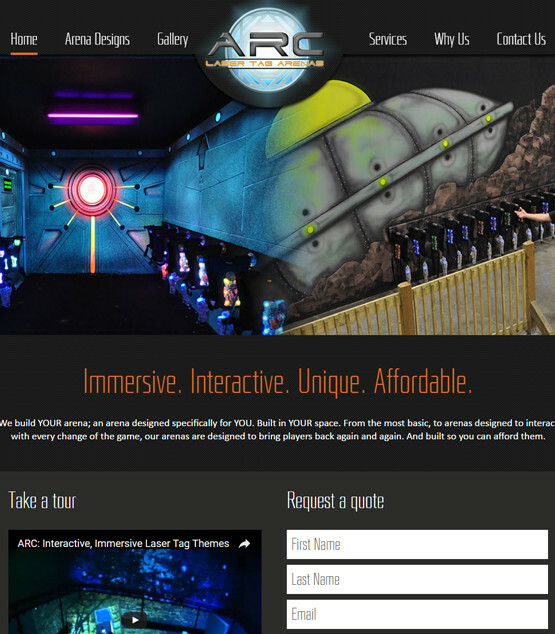 Apart from the short “Request for quote” forms the website also offered the visitors to fill in a detailed “Request for quote” form which captured much more details related to the site, products that the client is interested in as well as any other requirements which would allow the sales representative at Arc Laser Tag Arena to understand the client requirements more easily. The admin section is also used to add / edit Products (which would be different arenas) as well as product items (used in building each arena) along with it’s per square feet price or per piece price or both depending upon the type of product item. Admin would also be able create new packages as well as edit / delete existing ones. The main crux of the CRM system would be the ability to manage clients and their sites from the admin area. Once the requirements from the client are clear, the sales rep can create new packages or select from the available ones, select a suitable proposal template and create a detailed proposal which would have placeholders where data would be populated from fixed content as well as other details under the respective site. Once a proposal is approved it can then be used to generate a final contract. Again the contract would be based on a specific package and have various details as per a contract template and the various sections of the contract can be edited by the user before saving the final contract pdf. Last but not the least, this entire custom CRM has been integrated with Pipedrive CRM, thus allowing the leads through the front-end to be managed through the Pipedrive deals as well. The website CRM can operate either in custom or Pipedrive mode as per Arc Laser tag Arena’s requirements. The sales representatives can also be added / edited / deleted through the admin section. When a sales representative would access the admin section they would have access to specific sections only like client / site management, proposals and contracts whereas the main admin can manage the entire site.